By the time the Chicago Teachers Union was forced into five strikes during the 1980s, the union had become successfully integrated at all levels, from the local schools to the leadership. 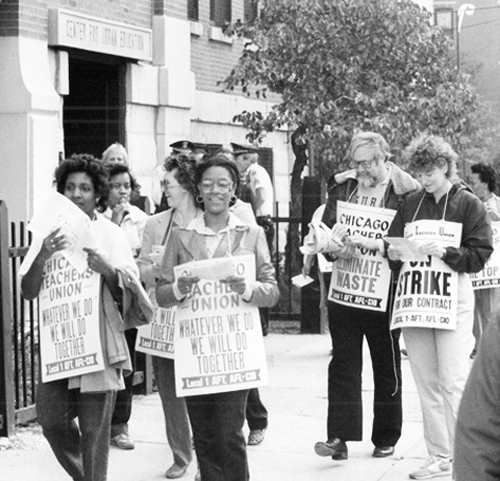 As a result, during the 1987 strike (above, at the "Center for Urban Education" at 160 W. Wendell St., one of the Scab Centers) picket lines were always integrated with little or no effort. By 1984, Jacqueline Vaughn was President of the Chicago Teachers Union, a post in which she served until her death from cancer in 1994.By the time the Chicago Teachers Union struck for 19 days in September 1987, the Board of Education was unable to open even one Scab School, and so the nation's third largest school system settled to keep open 23 locations across the city for what union members on the picket lines called "Scab Centers." Nobody knew when the strike began in early September 1987 that the teachers and other union workers would be out for 19 long days. Nor did the scabs realize that they would wind up collecting an entire month's pay for sitting around doing virtually nothing inside the 23 locations that were "open" during the prolonged strike. And yet the 1987 strike, led by the Chicago Teachers Union, was as strong on the last day of the strike as it was on the first day of the strike. The failure of the union leadership to maintain communications with the rank and file resulted in a media trick that helped end the strike, gave rise to the first wave of corporate "school reform" (the LSC based School Reform Act of 1988), and, as it became clear in retrospect, began the process of distorting Chicago history that would continue well into the 21st Century. By the end of August 1987, there was no reason for reasonable people -- or all the pundits in Chicago's corporate media -- to expect any strike at all. After all, in a city massively racialized and with racial segregation the highest in the United States of America, the Chicago Teachers Union was a contrarian example. As a result of more than a quarter century of democracy and internal struggle, the CTU was integrated at all levels. Two of the union's five officers, including President Jackqueline Vaughn, were African American. At every level, from the union's 45-member Executive Board to the delegates in the 800 (or so) members of the House of Delegates, the racial boundaries that characterized the rest of Chicago were almost non-existent in the CTU. The last attempt by the bosses of Chicago's public schools to play the racial card had failed during the lengthy (13 days) strike of 1983 [as I've reported earlier]. At that time, California native Ruth Love tried to play race games against the strike, finally striking out (and costing herself her credibility and her job) by announcing that she was going to open three schools for the sake of the children and then marching through integrated union picket lines which grew as the day wore on, first at Piccolo, then at Witney Young, and finally at Dixon. By the day's end, a frazzled Ruth Love was talking nonsense, and the nonsense (she compared the pickets who were cussing her out with the racist white police in Birmingham Alabama, when in fact most of the pickets were African American women!) wound up on display on all the city's TV news stations that night. And so the 1980s continued, and the ruling class of Chicago continued to try and stop the Chicago Teachers Union from exercising its legal right to strike. The union struck in 1983, 1984, and 1985. After watching the stalling of the Board of Education through the decade, the union's House of Delegates approved a policy of NO CONTRACT NO WORK in time for the negotiations that were taking place during the summer of 1987. -- The Mayor of Chicago, Harold Washington, was Black and had won his first term against vicious racism in 1983, in a large way because so many teachers and other public workers used their days to get out the votes for "Harold." -- The Superintendent of Schools was a veteran Chicago educator, Manford Byrd, who like all administrators in those days had come up through the ranks. Washington had made sure that Ruth Love was dispatched back to California after the debacle of the 1983 strike; when her term ended the Board of Education voted not to renew her contract and immediately voted to install Byrd in the top job. -- And the President of the Chicago Teachers Union was veteran educator Jackqueline B. Vaughn, who had risen through the ranks of the union during the tumultuous struggles against the racists who had held union power during the 1940s and 1950s. By the time of the 1983 strike, Vaughn had been CTU Vice President, and during the strike Vaughn became the union's public speaker after Ruth Love tried to play the "race card" so common in Chicago. After winning another term as CTU Vice President in May 1984 [disclosure: I was the candidate for President on the opposing ticket against Robert M. Healey and Jackie Vaughn in 1984], Vaughn quickly became CTU president. Following his 1984 victory, Healey was offered the job as President of the Chicago Federation of Labor. In July 1984, Healey left the CTU and Vaughn went into the job as President. As so, despite a couple of small strikes which union leaders and many members attributed to the machinations of the Chicago School Finance Authority, by 1986 and 1987, the CTU had adopted its NO CONTRACT NO WORK policy, but the union's leaders didn't believe they'd have a problem getting a deal from the school board, with Byrd in charge of the schools and Washington in charge at City Hall. Why everyone was so wrong is a much more detailed bit of history, not ready for the time I have for these chapters.